Whether you’re a social media power user or new to social media, community manager or business owner, you understand the importance of organization. When you first start adding and organizing your social media networks, apps and search terms within the HootSuite dashboard, things can get a little chaotic. Using tabs is the easiest way to keep your dashboard organized. Like folders in your computer, tabs help separate and categorize your business and personal social networks and apps into unique spaces for easier viewing. 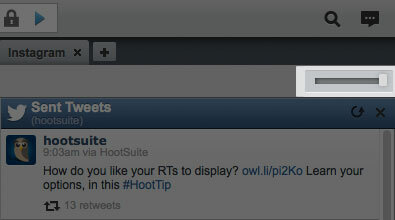 In this #HootTip we’ll show you how to add tabs to your dashboard to help you organize your social. 1. From the launch menu on the left, select the house or Streams icon. 2. Click the plus (+) sign to add a tab. 3. A new tab will appear with “untitled” highlighted. Start typing to name the tab. Unless you want a blank tab, click on the “Add a Stream” guide that automatically appeared in your new tab and follow the prompts. *Note: Streams help further breakdown each tab according to social networks, apps, functionality, keyword searches, etc. Here’s a Social Media Coach post to learn more about tabs and streams. Click and drag your tabs along the top of the dashboard to put them in an order that works best for you. Every stream inside your tab is self-contained. 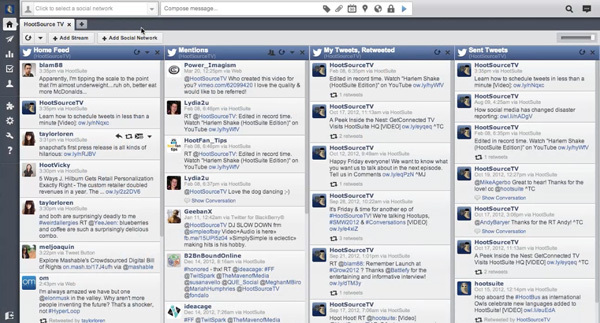 So you can monitor the Tweets, Facebook photos, and YouTube searches related to your Tab title. 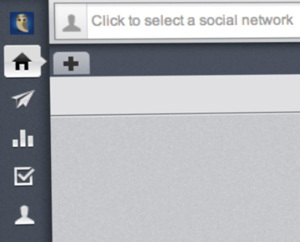 To add a social network: in the stream guide click “Networks”, scroll to find the network and its associated options menu will appear. From there, select the network’s functionality of your choice for that stream. For example, let’s say you’re setting up a Twitter tab for your business. We recommend that you add different streams within that tab for your business’ Home Feed, Mentions, Direct Messages and ReTweets. To add an app: in the stream guide click “Apps,” scroll to find your app of choice and follow the prompts from there for signing in and set-up. For example, let’s say you’re setting up an “Instagram” tab for your business. We recommend that you add different streams for your Home Feed and Your Photos. Add another stream for the Statigram App to monitor your Instagram analytics. Keep an eye out for a new #HootTip ~ they’re short, sweet and retweetable so you can share your HootSuite expertise with your friends and followers. To help you adjust your stream width, use the handy toggle bar. In the far right corner of your tab row you will find the toggle bar. Slide the toggle back and forth to adjust stream widths.